Warning! EssayMama.com is a part of Universal Research Inc. essay writing services network, notorious for the breach of contract and selling essays that have already been sold in the past. EssayMama.com is yet another average quality essay writing service owned and promoted by Universal Research Inc. The writers at EssayMama are underpaid so they have lack of motivation and often don't follow the instructions. However, it seems that some students who don't care about the grade actually like EssayMama.com due to its service and discounts. Of course, those students who don't care what grade they will get are usually those who don't want A papers. Like with BestEssays.com (Universal Research Inc. most known website), this service also creates fake reviews, leading you to believe that you can trust them. Also, since it's ruled by Universal Research Inc., you should remember your essay may be reselled in the future (there is undeniable evidence that they violate the terms of the contract). 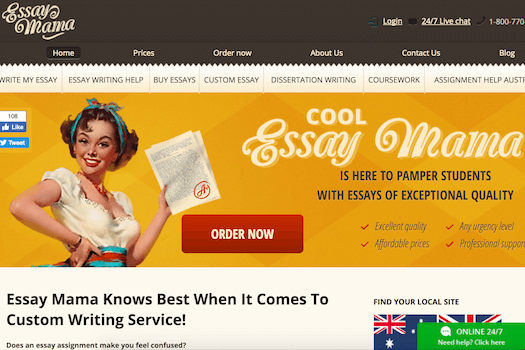 Again, take a look at BestEssays.com review, because there you'll find all the answers about Essay Mama writing service.